More choices than ever before. Choosing and Maintaining The Right Pool Finish. Masonry or fiberglass pools can be refinished with an epoxy pool coating, which is less subject to interactions, with the water chemistry. Ultra Poly One Coat, manufactured by Ultra Polymers, Inc., is a Hybrid-Epoxy Coating and is used in pools, spas, water parks and water features, all across the U.S. 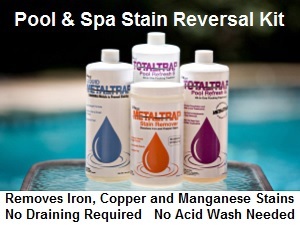 The MetalTrap Stain Reversal Kit can eliminate the staining consequences of heavy metals, present in the source or introduced through metal corrosion, ionizer use or copper algaecide use. The Circulator is a return jet replacement fitting, that improves filtration, eliminates the dead zones that promote algae growth, improves sanitizer distribution and chemical dispersion. How to choose the right finishing product for a pool? Masonry pools can be finished with a variety products and techniques. The finishes include: marble-dust plaster and exposed quartz, aggregate surfaces. Finishes, other than plaster, can be used: paint, epoxy, fiberglass and more. There are advantages and disadvantages, cost considerations, suitability and life-expectancies to consider, when deciding which finish to choose for a new pool or a pool resurfacing or refinishing. As an alternative, Ultra Poly One Coat is a hybrid-epoxy coating, that can be applied, as a DIY project. The products is used in pools, spas, water parks and water features all across the country. If problems arise, refer to the Pool Problems Page, as a source of problem-solving information, broken down into various categories. Scroll down the page and click on the linked keywords, catch phrases or images, in the archived answers below, to access additional information, on that topic or product. My Gunite/plaster pool is 22 yrs old and has never been drained. The plaster has some stains from leaves, chemical reactions in the water (well), and about a 3' section of tile has fallen off. I have not had anyone come out to look at the pool. I've been told by a pool company employee in the store that it most likely needs re-plastering and re-tiling. If that is true, can the pool be drained? Few pool make 22 years without being refinished. Draining always involves risks, especially if the construction is weak or if the ground water level is unusually high, Stains alone are not grounds for refinishing. Refinishing is a must when the plaster wears thin over time and gets close to the underlying gunite. The tile problem probably justifies a refinishing, in and of itself. You could retile the pool and use Ultra Poly One Coat to refinish the pool. It is a hybrid-epoxy coating, that is more stain resistant and has a 15 year warranty. No acid washing is required, preparation is easy and there are no primers or sealer required. Any it only requires one coat. Using well water will always present a risk of staining. Using a MetalTrap dual-cartridge filter to refill the pool will help remove the stain-causing minerals. Adding some liquid MetalTrap, as the pool is being refilled, will add some extra protection. Using the MetalTrap filter, when adding any new water, will help keep the unwanted metals and minerals, from being added to the pool. I hope that this information is helpful. ► Refinishing With Fiberglass, Aggregate or Paint? I've just purchased a home that has an inground pool (approx 20' x 40' ) in need of serious repair. The contractors I've talked to suggest a new coping, new tile and refinishing. The problem I'm having is deciding on the type of surface to use. I am afraid of the pebble finishes because of the possibility that they would become rough over time. That seems to leave the quartz finish as most desirable. Now, I'm being told that a fiberglass finish is an even better choice. The information I've found on the web is all about new fiberglass pools, not refinishing of older pools. Is this an acceptable pool repair technology and can you tell me its advantages over quartz? Thanks. My opinion. DON'T EVEN THINK ABOUT COATINGS THAT CONTAIN FIBERGLASS!!! What follows, in bold, is a real, unedited letter, from about an hour ago. "My pool seems to have small fibers that cause my guests to get very itchy after using the pool. Is there anything that can be done to correct this? When we had the pool resurfaced from gunite to "fiber glass" (I think that's it) we were told it was 'guaranteed for life'....like most of those deals.........the company is out of business. We were told it was 5 layers of acrylic. It looks beautiful. Everyone always says how blue and clean the pool looks.......but with the tiny fibers causing everyone to itch.....looks aren't everything. Any advice would be appreciated." Thank you. Ellen S.
I wasn't sure what to tell her, short of sandblasting it all off and replastering. I don't know, if there is a simple solution. I would prefer aggregate or paint. The exposed aggregate finishes differ somewhat in appearance, but are all based on aggregates and white Portland cement. I do not have specific information for every product, but there are differences. Not all aggregates are as resistant to chemical problems or the effects of chlorine over time. I suggest that you check into the contractor's track record and ask to see some recent jobs. A properly painted pool will be easier to maintain than a plastered pool. The chemistry will be more consistent and there will be few er places for the algae to hide. There are lots of paints out there. Some need all sorts of preparation. Others can't be applied, if the humidity is above a certain level -- which probably won't happen during the summer months. Some paints need several coats. Not everyone takes the time to do it right and the result could a poor job. A contractor can skimp and offer a lower price. Not really a bargain, if the pool does not look as it should. Ultra Poly One Coat is a high performance, hybrid -epoxy formula that only requires a single coat. It is very durable and long lasting. Surface preparation consists of a cleaning with a citrate solution and then a power washing. Humidity is not an issue and no primers or top coats are required. Undecided? Read the first letter on this website page: Pool Coatings and Paint. ► Choosing A Refinishing Product? My inground Gunite pool is showing calcium. My neighbor has the same problem, and since it's been about 5-6 years since the last resurface, (marcite), we were thinking of going in on a two for one deal with a contractor, if possible. The question is this. Is there any product out there that will finally eliminate this problem from recurring? We are looking into a product called that is for used for making boat hulls. A problem is that it comes in black, and black and then black. There are rumors of a dark blue or "blue" color finally, but never seen yet. My question is, have you heard of a pool finish that would finally and permanently resurface and seal a gunite pool? Thanks for your advice, great web site. Finally and permanently sounds too much like forever! Considering the possibility or staining, cracking, weathering, abrasion and chemical action, it is probably a matter of longer-lasting. In place of marcite you could resurface with an exposed aggregate finish. You seem to be interested in something that will avoid the periodic maintenance associated with masonry finishes. I suggest that you look into some of the plaster/aggregate pool finishes that utilize aggregate particles other than marble dust. Some products use quartz and/or ceramic aggregates. This type of product can be long-lasting, more chemically resistant and less prone to fading and staining. Some products are more durable, smoother to the touch, less prone to fading and color bleeding and able to resist abrasion. Such products are available in a series of colors and appearances. The cost differences, over the life of the finish, may not amount to that much. Painting is an often-overlooked option. Ultra-Poly One Coat is a hybrid epoxy coating with a 15-year warranty. Its smooth surface makes staining and algae problems less likely and makes for easier maintenance, in terms of the water chemistry. Go with the look you like and a contractor that is experienced. Good luck with your choice. ► Aggregate Surface: What Is It? A friend bought a re-sale with a pool that was finished with an Aggregate Finish, but doesn't know who makes it, distributes it and whether or not it is a paint, a plaster additive, etc. I love the look. I am about to refinish and would like to know more about this type of product. Thanks. The product is an alternative to conventional marble-dust plaster. It is a masonry finish that is applied to the inner surfaces and may be followed with an acid etching of the surface. This etching exposes some of the aggregates: quartz, granite, pebbles, ceramics, etc. Hence, this type of product is called an Exposed Aggregate Finish and leaves a textured finish. It has a different look compared to the smooth plastered finishes. Try and see some completed jobs and check their references. Having an experienced contractor is important. Good Luck. ► Something Smooth And Durable? We are building a new pool in AZ and are having trouble choosing a finish. My wife wants something very smooth on the feet and has eliminated some of the possibilities. I want something durable and so am considering the pebble sheen but wonder if the extra cost is worth it. Do you have any suggestions or places where I can get additional information? Thanks. I am really not overly familiar with every product and there's no sense in misleading you. This can be a matter of individual taste. I suggest that you look at examples of various and make a decision based on that and the budgetary considerations. There are finishes that are very durable and smooth. Painting is an often-overlooked option. Ultra-Poly One Coat is a hybrid epoxy coating with a 15-year warranty. Its smooth surface makes staining and algae problems less likely and makes for easier maintenance, in terms of the water chemistry. Good luck with the pool. ► Dealing With A Rough Surface? My exposed aggregate pool is just starting to show its age. The surface has become rougher, due to acid washings, over the years. Will Ultra Poly Coat One be able to smooth this out, without having to sand? We have had some staining over the years and had to acid wash a few times. I have been told that an epoxy-type of pool coating will last a long time and will be less prone to metal staining. Is this something to consider? Ultra Poly One Coat forms a relatively thick counting that will smooth out the surface and reduce the roughness. Surface preparation consists of cleaning with a Citrus-Based cleaner and following with a 3500 PSI power washing. It is also more stain-resistant than masonry surfaces. Major defects should be repaired using patching material or hydraulic cement. Do not use silicone products. Ultra Poly One Coat is a long lasting, durable epoxy hybrid that is available in 5 stock colors: custom colors are available. It is something worth considering, as it less expensive that replastering and has a 15-year warranty. I hope that information will prove helpful. We have a marcite pool that is just starting to show its age. We have had some staining over the years and had to acid wash a few times. I have been told that an epoxy-type of pool coating will last a long time and will be less prone to metal staining. Is this something to consider? Painting is a serious option and does afford the benefit of making the pool water chemistry easier to maintain and is less prone to metal staining. The look is different and the coated surface is smoother and less likely to harbor algae. Ultra Poly One Coat is a long lasting, durable epoxy hybrid that is available in several colors. It is something worth considering. I hope that information will prove helpful. ► Exposed Aggregate Vs. Plaster? What are the advantages of using an exposed aggregate finish over plaster, besides aesthetics? Most exposed aggregate finishes use quartz and/or coated aggregates in place of the crushed marble that is used in conventional pool plaster. This creates a finish that is less prone to staining and less involved in the pool water chemistry. It does allow for a variety of textures and looks that are not possible with plaster. The finished product is rougher and less slippery to the touch. Some finishes are smoother and more durable than conventional finishes and might be worth investigating. I hope that I have been helpful. We had our pool re-surfaced and with an exposed aggregate material and a couple of months later we began to see stains. They look gray, almost like gray clouds all over. Question, how can we take care of this pool finish problem? Would acid wash work? Thank you! It sounds like a heavy metal problem. I suggest that you have the pool water tested for iron, manganese, copper and calcium. Before you do anything, I suggest that you look into the warranty. You don't want to do anything that might void the warranty. It seems probable that the water contained iron and other metals. Dealers don't always run these tests and metals don't always show up. Pools that turn gray or darker after addition of chlorine or pH raising chemicals, usually have iron and other heavy metals present. This is especially true, whenever well water is used. I suggest adding Liquid METALTRAP: it is phosphate free and works over the full pool pH range and beyond. Adding this chemical can help avoid more staining and/or discoloration. If staining has occurred, it can be removed with METALTRAP Stain Remover. This concentrated product helps to reduce and solubilize heavy metals, so that Liquid METALTRAP can keep them in solution in a chelated state, which is less colored and more stable. Following up with a recirculating treatment, using the METALTRAP Filter can permanently eliminate the metals. All you need is a garden hose and a small pump to do the recirculation. Once you get the water looking right, make sure that you run all new water through the METALTRAP FILTER. I hope that I've been helpful and that the problem will get solved. ► Getting Started In A New Pool? I am having a pool installed with an exposed aggregate finish and am wondering if there is anything special that I need to do as the pool is being filled. The water is soft and I plan on using a saltwater chlorinator system. I appreciate having so much information available and being able to ask a question. Thank you. You should discuss chemical additions with the contractor, as you don't want to do anything that might compromise the warranty. With soft water it is unlikely that iron or other heavy metals are a major concern. However, it is best to have the water tested for iron, copper and manganese. If these metals are present, the pool should be treated before other chemicals are added. For each 0.5 PPM of heavy metal, add a dose of a quality metal treatment, such as phosphate-free Liquid METALTRAP, as soon as possible and as the water is being added. Adjust the pH to 7.2-7.6, the total alkalinity to 80-120 PPM and the calcium hardness to 200 PPM. Start the pool off with a shock treatment and add the necessary amount of salt, based on the timing suggested by the contractor. From this point on, a salt chlorine generator should be able to meet the pool's chlorine requirements. Test the water frequently, as it is important in helping to maintain the best appearance of the pool's surface. An all-digital, ColorQ tester makes water testing easier: no color-matching or guesswork. I hope that I have been helpful. ► Crack In The Finish? My gunite inground pool shows a crack. The pool is finished with marcite and is 6-7 years old. There has been a lot a rain lately and I think there was some settling. How should this be fixed. Thanks. If the crack is the result of erosion, it is quite possible that it will grow in size. You might have to have a concrete or structural stabilization device, such as the Torque-Lock System installed, as this will help prevent the crack from expanding. These devices work like staples and pull the opposite sides towards one another, helping to stabilize the repair. They are countersunk into the surface and then covered with the same type of material that was used to finish the pool. Good luck and I hope that this information proves useful. I am planning on repainting my gunite pool next year. I have notices a few cracks and defects on the surface. I am not losing any water, above normal, so far a I know. I would like to repair the problem spots this year and paint next year. I don't want to have to drain the pool to get at theses underwater areas. Is there something that will work under the water. Thanks for the help. It is a good idea to do something to prevent water getting behind the original plaster finish. Boxer Adhesives manufactures a complete line of product for making underwater repairs. One of the products is an underwater epoxy kit. The material is white and can be painted over when you're ready. In the meantime it will make a water tight repair, without having to drain the water. Just follow the simple directions. Good luck and I hope that I have been helpful. ► Concerns About Colored Finishes? Hello again Alan. Thank you for your quick response to my color loss dilemma. I agree with you about the salt system as a good alternative to traditional sanitizers. I'd much rather trade a scale problem for a color loss one, which seems to be one of the trade offs with salt. Newly plastered pools that are put on salt systems seem to be constantly fighting a scaling situation, especially during the first month of plaster cure. My question with salt is; Is it necessary to shock from time to time to eliminate chloramines and other organic wastes. If so, which of the many forms of granulated oxidizers would be most color-friendly. From what you've mentioned earlier, I assume granulated trichlor would not be your choice. Since strong oxidizers seem to be public enemy number one to colored plastered surfaces, shouldn't manufacturers of color for plaster and blenders of bagged plaster materials include some warnings about the use of oxidizers with their products, instead of just mentioning that their "Warranty" does not cover color loss. How would a concerned homeowner, builder or service tech know how to prevent a possible detrimental oxidation level. I know that ORP levels are not new to the industry. Is there an ORP level that at some point becomes a problem with color in plaster?? Most warranties or guidelines pertaining to the maintenance of plaster products casually mention the adherence to N.S.P.I guidelines. I think you can adhere to those basic water balances and sanitation levels and still run in to problems when it comes to the use of certain chemicals meant to "shock" a pool or "enhance" the effectiveness of your chlorine or bromine. What do you think? Revisiting chemistry after my last college course 35 years ago isn't any easier than it was then. Thanks again in advance for your assistance. Trichlor granular would be one of the worst choices. Salt chlorinators and scaling do not go hand in hand. Adding 2500 PPM of salt to already hard water could add to the potential of the problem. However, keeping the pH under control should eliminate the problem of scaling. It is no t the salt that scales, it is the calcium compounds. The color loss problem of certain pool finishes is more akin to a vinyl liner problem. You want to avoid extreme high chlorine levels, especially with low pH, as that only increases the aggressiveness of the chlorine. Gas chlorine would be an example of a bad choice, in my opinion. In addition, you want to avoid direct contact between the chlorine and the finish. Trichlor granules and calcium hypochlorite broadcast into the pool are examples of bad choices. Lithium or sodium hypochlorite, dichlor or non-chlorine shock are better choices. If you are going to use chlorine, nothing gives you control over the situation better than a salt chlorinating system. You control chlorine production by selecting a setting and/or varying the hours of operation. Shock treatment by definition means boosting the chlorine level higher than normal and this can pose risks to certain finishes. All of the water passing through a salt chlorinator is superchlorinated and all of the chloramines are destroyed. Under normal conditions the need to shock is greatly reduced or eliminated. Maintaining the free chlorine level and the pH within guidelines assures that the ORP is normal. I hope that I answered all of the questions. ► Stain Bleeding Through The Finish? There is an area in the hopper of my inground pool that has a dark discoloration. I have tried chlorine and ascorbic acid treatments and neither has helped. My pool serviceman thinks it may be a stain caused by a re-bar being too close to the surface. The pool is not that old and the finish is perfect, everywhere else. Is there something else that I can try? You have tried, what I would have suggested. Most likely the pool tech is correct. What you can do is use an underwater Premium Graphic Mosaic Mat and position it over the discolored area and create an underwater landscape. These products can be used underwater, so draining will be unnecessary. It would be an easy and attractive solution. It will add color and an interesting focal point, while it hides the problem. You can choose from Dolphins, Coral Reefs, Turtles and more. When you're ready to refinish the pool, you can consider other options. I hope the suggestion is helpful. Last year I had my in ground pool resurfaced with fiberglass. Initially I was quite pleased as it looked beautiful. The first time we swam in the pool, after the resurfacing the water appeared 'milky'. In fact it looked just like skim milk after an afternoon of swimming. We found that if you rub your hand on the side, the finish appears to be coming off. Several months later we found a blister on the bottom of the pool more than 2 feet in diameter. I have been trying to deal with the company who did the resurfacing, but I am getting no where FAST! They have told me things like the 'milky' water if from algae in the pool, then they told me it was improper chemicals. THEN, they told me it was an improper mix of chemicals. They will take NO responsibility for the 'milky' problem. I heard that that is caused from incorrect percentage of surfacing agent used during the finishing gel coat. Do you know if that is correct? They are willing to fix the blister, saying they are a perfectly normal occurrence. HELP Alan. Do you know what is causing these problems. I am out $8500.00 and my pool is not right. Any help is GREATLY appreciated. Without more specific information, I can only tell you possible causes. There could be a filter problem, an algae problem or a chemistry problem or more than one. Or it could be the finish. There is no way for me to know. Start by checking the overall pool chemistry. Blisters are not what I would call normal. Chances are you will see where the repair was made. I have heard lots of horror stories about re-fiberglassing. I would have suggested Ultra Poly One Coat: a hybrid epoxy with a 15-year warranty. It would have been a fraction of the cost. Dead algae can pass right thought a some filters. It is vital to boost the Free Chlorine level to allow it to decompose the dead algae. Adding a blue clarifier can help, but ultimately it is the chlorine that will do the job. For free chlorine testing, I suggest using LaMotte Insta-Test strips, as they provide the right kind of information. High calcium hardness, over 400 PPM, can cause cloudiness especially if the pH and TA are also high. Get the overall water chemistry under control and see if that helps make a difference. When the chemistry is right and the water remains cloudy, one has to consider that there might be a filter problem. Are you able to maintain a stable free chlorine level of 1-3 PPM? Or do you have to add lots of chlorine? If you have a sand filter it may be channeled and requires a cleaning and fresh sand. If you have a sand filter, I suggest that you consider using a zeolite: it's a sand filter replacement media, that weights 1/2 as much as sand and produces much better water quality. Much better! Some sand filters cannot remove dead algae. 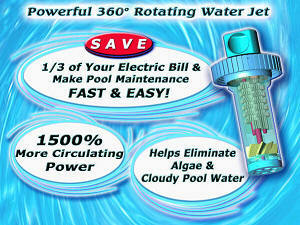 Poor circulation can be part of the problem and The Pool Circulator can be the solution. It is a simple to install device that makes a dramatic difference in the water circulation. I hope that this information proves helpful. ► Plaster Being Eaten Away? Last year was my season with my gunite pool. It has a white plaster finish. When we went to close the pool I noticed spots all over the finish. When I felt them it was almost like the finish was being eaten away. They were rough spots that went down into the plaster and were not raised. I am being told different things by different companies. Such as, it was from a chemical imbalance, from using well water to fill it when it got low during the dry season, to mustard algae. And as far as fixing it, I am being told that they could add chemicals, such as acid to the water to kill it and steel brush the finish smooth again. Then, drain it and acid wash it. I am concerned about both these procedures because it is a new pool and I had a pool maintenance company maintaining it, with chlorine products, every week. Can you please let me know why this happened and what I should do? This type of problem is not common and the causes are not fully understood. Suggesting that this is mustard algae is a diversion. The well water might cause staining, but if the overall chemistry was corrected, it would not etch the surface. Staining maybe! It is possible that the spots are the result of the use and abuse of calcium chloride that was added to the plaster mixture. There is no remedy for the problem, other than refinishing. An excellent article appeared, on this topic, in Service Industry News on 1/15/03. The nature of the source water and the current pool water chemistry can both play a role in this problem. Exactly, what is causing the change in appearance might be determined by a complete pool water analysis. Parameters such as pH , total alkalinity, calcium hardness and heavy metals should be determined on the pool water. Testing the tap/well water might also be of benefit. New pools need to have the calcium hardness level in the 150-200 PPM range or else the water will extract calcium from the walls. The test results are necessary to both find the cause and prevent further problems. This is either caused by poor chemistry, mainly pH, TA and hardness or a poor or incorrect plaster mixture or application or both. No one knows exactly why or is willing to step up to the plate. It is easier to blame something or someone else. I have no basis for pinpointing the exact cause, but I think this pool needs to be refinished, as it is only one-year old. You deserve better. Sanding the surface smooth might not present a permanent solution. Some finishes are more chemically resistant, than many products in current use. You could also have the pool painted. Ultra Poly One Coat is a hybrid epoxy with a 15 year warranty. It is more chemically resistant and has little effect on the overall pool chemistry. Read the first letter on this page: Pool Coatings and Paints. Good luck and I hope that I have been of some assistance. Can I use white stucco (white cement + silica sand) to replaster my pool instead of a pool aggregate finish (white cement + silica sand)? What is the difference, if any, between the two? Thanks a lot. The answer is NO! Stucco formulas substitute hydrated lime, for about 30% of the white Portland. We can’t put lime into pool plaster. Lime is Calcium Hydroxide, a soluble component that would leach into the water and add porosity. Stucco uses it for air entrainment and freeze thaw durability. Stucco and Pool Plaster are different cement chemistries and should not be interchanged. Pool finishes are made from white Portland cement and various aggregates. The grades are intended for use in pools. I would use something that I know will work, considering all the work involved. I hope that I have been helpful. Enjoy the Holidays. The water quality is fine. 1) would you suggest draining the pool this spring to solve all of the above problems? I have to drain 1/3 of it regardless to get to the hairline cracks, and it will be easier to get the main drain cover on by draining the whole pool, but will this also help at cleaning off the pool stains (i.e. maybe power wash or a good scrubbing with a cleaning solution instead of the sock technique)? 2) Any suggestions for the two hairline cracks and the worn pool step coating? Based on reading the website postings, I do not want to paint the pool, but I do not think the pool is in bad enough shape to warrant a resurfacing yet (I hope). Draining the pool could make sense. Call it one-stop repair and fix up. As long as the pool is empty, you should give some thought to a refinishing. It does sound like you are on borrowed time and why pay to replace all the chemicals in the water twice? If the stains are tannins the "sock trick" is not needed. A shock treatment, if there is water in the pool, or a chlorine wash, if it has been emptied, should completely remove all of the tannins. It would be a good idea to patch up the step, along with the hairline cracks. The best option would be to resurface the pool, after the repairs, that is if the budget allows. Otherwise the aesthetics of the pool, in the repaired areas, will always stand out. A repair pro probably could work wonders and buy you some more time. Something to look into? Good luck and I'm sorry that I couldn't be more helpful. ► Color Of the Finish And Black Algae? I am having an inground pool installed and for the finish I chose the color black made from a product made from a resin with the aggregate look. Does the color black make it easier for black algae to form or are all colors the same? I have never been asked this question about a pool finish before. There is no reason to suspect that algae growth problems would be related to the color of the pool finish. Algae growth is directly related to poor pool maintenance, inadequate pool sanitation practices, the failure to maintain proper water chemistry or the overwhelming of the sanitizers, by high bather demand or bather wastes. Black algae is not particularly common and can be difficult to remove. However, with a masonry finish pool you will always have several treatment options, if a problem ever develops. Enjoy the pool. We are installing a gunite pool. We wanted a dark-bottom pool. However they told us that the color will fade over time, as soon as a month, and that you can't use shock or it will bleach the color. Is this true? I'm concerned because, if we decide to go with the dark color, we are told that they will not warranty the color. Can you send me some information on dark-bottom pools, problems with them or another information that could assist me in making a decision. Thank you for your time and help! Sincerely. The majority of the pools out there are blue or some light color. And there are black pools as well. I can't speak for every type of pool finish out there, but any product that can fade, in a period as short as a month, is questionable at best. A pool with a masonry finish is more resistant to the elements - isn't that part of the reason that a masonry pool is chosen over vinyl. High levels of chlorine, over a prolonged period of time, or the direct application of chlorine to the surface, can affect the finish. For this reason, it is always best to add chlorine in a controllable manner, as with a chlorine feeder or a salt chlorinator. This avoids having high chlorine levels or product sitting on the bottom. I don't know which finish you are choosing and even if I did, I would still suggest that you consider a finish that will come with a reasonable warranty. If they can't warranty a dark pool finish, they shouldn't be offering it! Most likely they are using organic colorants and they are known not to last all that long. I suggest sticking with finishes that use only inorganic colorants and they hold up better, over time. Good luck with your decision. I just had my pool replastered. The plaster contractor told me to brush the plaster dust several times a day for the first week and to add no chemicals. What exactly is this dust made of? It's white and clouds up the pool water. Is there some other way to handle or cure the plaster so that the dust won't form in the first place? Thanks. The plaster mixture consists of white Portland cement and ground up marble. The dusting or clouding is probably calcium carbonate and is harmless. I'm sure that if you ask the question, of what do about the curing pool finish, to enough people, you'll get a variety of answers. I suggest that you follow the contractors recommendations, as he should know what works best with the type of finish he applied and with your local water. To do something else could void the warranty! Let the cloud settle and vacuum it up. Once the chemistry is adjusted, it should slow up or even stop and filtration should do the rest. You'll be in the swim soon enough. Is there a suggested way to keep the gunite smooth for a longer period of time to prevent pitting? Good question! Yes, there are things that can and should be done to protect the appearance of the pool finish. Avoid Corrosion Water Conditions: maintain the pH at 7.2-7.6, the total alkalinity at 80-120 PPM and the calcium Hardness at 150-200 PPM. This will help keep the walls from being etched. If the water is soft or has a calcium hardness below 150 PPM, you must add calcium hardness increaser to the pool or the pool water will extract calcium from the walls. Avoid Direct Chlorine Contact: add chlorine is such a way as to avoid direct contact with the pool surfaces. A built-in chlorinator or a salt chlorinator system are well suited for this purpose. Use liquid chlorine, lithium hypochlorite, non-chlorine shock or dichlor, when a shock treatment is required. Avoid Scale Formation: high levels of calcium hardness, usually above 400 PPM can lead to crusty-feeling scale deposits. Once your calcium hardness level is above 200 PPM, stop all use of calcium hypochlorite products, so as to avoid further increases in the calcium hardness. When the time comes to refinish the pool you might want to look into something other than marcite. Painting is an often-overlooked option. Ultra-Poly One Coat is a hybrid epoxy coating with a 15-year warranty. Its smooth surface makes staining and algae problems less likely and makes for easier maintenance, in terms of the water chemistry. Those are the suggestions. I hope that they prove helpful. ► Cause Of Fading Finish? Hello Alan. Enjoyed reading through the archives of pool staining problems. Wasn't able to find the information that has been nagging me for some time. Hope you can shed some light on what seems to be very controversial subject among "pool professionals." Many pools are being plastered with pigment added; site blended batches using white cement, marble mix and color & pre-blend products come from the manufacturer, everything in the bag including dry color, just add water. There are marble base products, quartz base products, pebble base products and even glass bead products. Who knows what else they'll think of next, to mix with cement to make a pool surface finish. Most manufacturers have warranties (of sorts) but none will warrant the color to remain consistent for any length of time. I realize that due to the harsh nature that a pool surface can be subjected to that an unlimited warranty would be foolish for a manufacturer, BUT no one will spell-out what specifically causes color to fade, bleach-out, mottle and flat disappear. Any information you could lend would be greatly appreciated. I know there are many others that would like an explanation of this very common dilemma and constant source of frustration. Thanks a bunch. You're right. For all the information on the "Pool Finishes" page, your question was not directly answered. A pool being maintained on chlorine is a oxidizing medium. The higher the chlorine concentration and the lower the pH, the stronger the potential for oxidation. Not everything underwater is affected by oxidation. Calcium carbonate (marble dust) and the various components of the white cement mix are already oxidized and are unaffected by the chlorine. However, the colorants and other additives in the mixture may be subject to the effects of chlorine, bromine and other oxidizing agents. Some aggregate finishes are much more resistant to chemicals and fading problems. Harsher conditions can be detrimental and should be avoided, in order to prolong the look of the finish, for as along as possible. This is something that you can control! For example, if you were to use gas chlorine, on a weekly basis, the chlorine level would be very high initially, in order to last for a week. This type of situation creates strong oxidizing conditions. On the other hand, if you could add chlorine at a very slow and consistent rate, you would avoid the spiking up of the oxidation potential. In this regard, nothing works better than a salt chlorinating system: the chlorine is produced at a controllable rate, is never added in a concentrated form and avoids harsh elevated levels or acidic conditions. So why you may have concerns and some unknowns about the pool finish, you can control the water chemistry to the benefit of the finish. Fading and "bleach-out" can be attributed to prolonged exposure to high concentrations of oxidizers. Mottling is probably more related to other aspects of pool water chemistry: pH, total alkalinity and calcium hardness. Once again, proper maintenance of the pool water chemistry can and will make a difference. You can simplify testing and eliminate guessing and color-matching completely. The ColorQ Testers are all digital and easy to use. I hope that I have filled in some of the blanks. ► Frustrated With The Chemistry? Alan, Perhaps you can help us. We just had our gunite pool re-plastered and we do not know how to get it up and running. It seems that no one agrees on how the chemicals are to be added and just how much and in what order. Very frustrating. The pool holds 16,000 gallons. The alkalinity seems to be the greatest concern. The plaster is leaching calcium into the water and my husband cannot get an answer to solve the problem. The pH of course is off, too and we do not know how long, in hours, it takes for things to equalize. Please help! It is common for the pool water chemistry, of a new or newly refinished plaster pool, to fluctuate and require the adjustment of several of the pool water parameters. The softer the fill water - the faster the calcium will leach from the walls. This will cause a rise in the pH and total alkalinity. The way to slow the leaching effect is to raise the calcium hardness of the water. By adding calcium to the water, the walls will be less subject to leaching and etching. Have the water tested for calcium hardness, pH and total alkalinity. You want the calcium hardness to be in the 150-200 PPM range. If it is below this range, add sufficient calcium hardness increaser to raise it into this range. Once done, it should be easier to control the pH and TA. Raising the TA to 80-120 PPM, will also slow down the leaching. The pH will tend to remain closer to 7.6, than to 7.2. The higher pH will, also, help slow down the leaching. In summation: adjust the calcium hardness and allow a few hours for the chemicals to disperse. Adjust the TA and allow a few hours for the chemicals to disperse, before testing and adjusting the pH. A local pool professional should be able to help you with the water testing and the chemical dosages. You'll chemical additions help on this page: Calculating Chemical Additions. 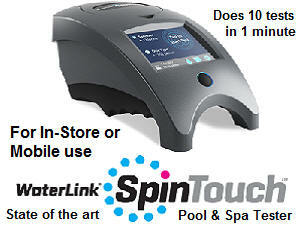 A ColorQ Digital Water Analyzer will provide and easier and more reliable way to test your pool water. I hope that this information will prove helpful. Our pool contractor prefers to design and build free form pool without the use of waterline tile. About 3 to 4 inches of the pebble type of finish is exposed to the air, above the water line. Several people have suggested that over time I will have a problem with a bathtub type of ring that will be near impossible to clean off of the pebble (as opposed to the normal challenge of cleaning such rings off of waterline tile). Plus my pool friends tell me the finish is supposed to cure under water and drying above water may result in cracks down the road. Pool builder disagrees and claims they have built their pools like this for years with no problems. What is your opinion? Pools do tend to get accumulations forming at the water line and it should be easier to clean it off of a tiled area. I would prefer a tile border! So far as cracks are concerned, this is something that may or may not happen, as it can depend upon the type of finish and application technique. In this regard, you have the contractors experience to go by. I hope that I have been of some help. Two summers ago our marcite pool began to stain and it appears pitted. The pits are yellowish in color. It became progressively worse. Last summer we had it drained and acid washed with no good results. The kids would come out of the pool with tiny slivers in their toes. The recommendation was to re-marcite the pool. We are currently investigating the process - price, material, color options, etc. Can you give us some recommendations, including what price range we can expect to be in. Thanks! It sounds like your pool water chemistry may have gone out of kilter adding to the pool finish problem. If that is the case, I hope that more attention will be paid to the topic, in the future. Pricing can vary depending upon pool size and condition and where the pool is located. I am really not able to quote costs with any degree of certainty. A few thousand dollars minimum is a good starting point. Marcite will cost a bit less than the aggregate finishes. Fiberglass or epoxy might cost somewhat more. Paint, such as Ultra Poly One Coat Hybrid Epoxy, is probably one of the less expensive options and can yield long-lasting and attractive results. I suggest that you decide what you would like the pool to look like, as a stating point. The various finishes have different looks, as well as different maintenance requirements and costs. Do some price comparisons and the decision is yours to make. A good water tester, such as the all-digital ColorQ Water Analyzers, can help you get your pool water chemistry, where it needs to be. It easy and simple to use and eliminates all color-matching and guesswork. Good luck. Thanks in advance for answering my question. Last September (2005) I had a chance to rent a home with a pool in Phoenix, Arizona. Having never maintained a pool before, I had no knowledge of pool maintenance. The problem is this: after reading the water ph and other chemical levels, the little chart that came with the kit said I should add more chlorine to the water. So I did, with the tablets, in the water. I didn't ask and had no reason to think this would leave brown stains on the bottom of the pool. I also thought they would go away over time, but have not. I moved out a few weeks ago and didn't think much of it, but now the homeowner is asking if I dropped chlorine tablets into the pool. I have no intention of lying and will answer him truthfully, but wanted to offer some advise if possible to assist in the removal of these stains. Your website is very comprehensive and thorough, but I didn't see anything specific to this situation. Your help would be greatly appreciated. Kind Regards. Chlorine tablets directly on a masonry pool finish can and will cause damage. It isn't necessarily a stain, but an alternation of the materials present. Some finishes are more prone than others. It is probably permanent. About all I can suggest is that you put about 1/2 pound of a pH reducer granules in a while sock and drop onto the stain. This will help dissolve the top layer and could even out the appearance. Good luck. ► Etched, Pitted and Faded? I have seen pool surfaces pitted and etched. The pools are serviced by pool service companies that use chlorine gas. Is this not a very bad way to sanitize and chlorinate a pool? Is this the reason that pools have to be re-surfaced? Why are pools being gassed? Gas chlorine is wicked stuff. Adding a weeks worth of chlorine all at once is not good for the pool surface or the bathers, for that matter. Some companies think adding more is even better. I guess the lure is cost. There are better ways to sanitize a pool: Salt chlorine generators, ozone generators, solar, ultraviolet sanitizer, ionization and mineral sanitizers: all products that maintain pools without the harshness of gas chlorine. I hope that this helps to point you in the direction of a better choice. ► To Acid Wash Or Not To Acid Wash? I am going to have by pool refinished with exposed aggregate. I am trying to decide on a finish and a contractor. Some said, I should acid wash and some say not to. Which is it? Appreciate any input you can provide. Common sense tells me that you should acid wash, but I have heard it argued both ways. Not every pool is the same and I can't imagine that some contractors always acid wash and others never acid wash. In the final analysis, the condition of the pool and the type of refinishing product have to be considered. I suggest that you select the finish and the contractor, as this is the major part of the decision. The contractor is the one responsible for the outcome of the job and I would defer to his opinion. He should know what works best with a particular product, in your local area. Good luck with your decision and enjoy the new look. Al, great site: very helpful-question if you could help me and others- some GRANULAR CHLORINE that apparently did not dissolve sat on different parts of the pool bottom-(plaster pool)- where it sat, it left white stains, that are pretty bad (spotted the pool. We drained the pool and decided to power wash it with 2400 psi power washer to get out some OTHER deep algae stains. It removed some, but not all of the algae stains on the plaster of the pool, and the chlorine stains still exist- we are refilling as I type this, with the stains, varying colors in the plaster as they are- when the pool is filled up again, can we do anything to get the plaster back to where it was? Is all lost? I told my dad that this was a chemical problem, not a power washing problem, and there was a difference-the pool is a decade old- but the plaster seems to be in good condition. Will superchlorination for an extended amount of time help when the pool is filled? Thanks. I think power washing a plaster pool finish can be a risky practice. You could damage the surface and separate the plaster from the underlying gunite. The white spots are probably due to the removal of all types of discoloring organic matter from the plaster surface. Superchlorination is the best way to try and even out the color. You could add some trichlor granular material. This is very slow dissolving and will remain on the bottom for an extended period of time. Use the brush to move the granules to areas in need of treatment. It may turn out to be a function of high chlorine concentration and time. Try lowering the pH to 7.2, as it will make the chlorine more active. Good luck and I hope that it works out for you. ► What To Do About Stains? Alan- Great site- I am recommending it to everyone I know who has had a problem. I recently began a new job as Director of a 203,000 gallon commercial pool with terrible brown stains all over. The pool was replastered 15 years ago, but was refilled with city water (water then turned brown) and run for 13 years on an older cast-iron filter. Needless to say the filter needed to be replaced due to rust etc. and this was done in 2001. The water quality is now excellent and chemicals are very consistent (chlorine 1.5, pH 7.5, calcium 250, alkalinity 100) but the staining is significant. We have explored many options from acid washing to replastering and there have been differing opinions. Since it has never been acid washed, 3 out of 4 companies feel it could withstand the process- but one said it won't last and needs resurfacing. With acid wash I understand the surface may become more porous, so I had the incoming water tested for Iron (0.192 mg/l), Copper (0.05 mg/l), and Manganese (0.025 mg/l). Since we are running a brand new filter (free of rust) I am considering it although my concern is the condition of the plaster. I would pay extra to fill the pool with properly balanced water then install a filtration system on the auto-fill to remove metals from the water before they ever get into the pool. Here are my questions: 1. How long should a plaster surface last and how many times can it withstand acid wash? 2. What type of filter would you recommend to keep metals out? 3. Is there a better strategy for keeping metals out or for treating my stains now (treatments)? 4. What are the "obvious signs of damage" to look for indicating that resurfacing is the best option? Finally, is it true that tile is the most permanent pool surface? This is a major project and I want to do it right. Thanks for your help I really appreciate it. Good questions, but I'm not sure that I can answer them. There is lots of subjectivity here! The pool surface is 15 years old and is badly stained. If you want the appearance to be something to be admired, you need to do something. Tile would be great, but the cost? Acid washing etches or dissolves the surface. It has been exposed to corrosive forces for 15 years and could be on borrowed time. I would opt to resurface the pool, inasmuch as acid washing might not remove all the stains and could increase the porosity. It is hard to say how long it could last or how many times it can be acid washed, as a lot depends on how the pool was plastered and how the water is maintained. When the underlying concrete starts showing through, it is obvious time to refinish. With the absence of visible problems, it is your call. Your water quality is a problem and trucking in water is a option. Treating with METALTRAP Stain Remover and a METALTRAP Filter is the better solution. Not only will it help remove the metals from the water, as the pool is being filled, but you can use it to filter all new water added to top off. Good luck and I hope that I have been helpful. ► Yellow Spots In A Marcite Pool? I have a marcite pool that has been in for 8 months and it has gotten yellow blotches on the bottom and the steps. The pH, chlorine, alkalinity levels are OK. I brush the pool each week. I was told the calcium would cause this. I have shocked it and I have put in a gallon of chlorine every two weeks. The yellow spots could be attributed to several causes: iron stains, algae growth and discoloration caused by fertilizer granules. Try the following to help narrow the choices and point to a solution. Put 1/2 pound of pH decreaser in a white sock, shut off the filter and drop onto a stained area Check after 1/2 hour. If there is a noticeable improvement, the likely cause was iron, in the water, or possibly fertilizer granules. Repeat this elsewhere, as needed to remove all of the stains. If the area is extensive, it may be necessary to drop the pH of the water to 5-6. After the stains are removed, add a quality, phosphate-free, chelating agent, such as Liquid METALTRAP. to help prevent a recurrence. Thereafter, add more of the product, prior to the addition of any makeup water. Restore the pH to 7.2-7.6. If the "sock treatment" did not work, the likelihood is that the problem is algae or even stains from leaves. Place a 3" chlorine tablet on a stain (NOT FOR VINYL POOLS), shut off the filter and allow to remain in place overnight. If improvement is seen algae or discoloration caused the stain. You can use Polymer Algaecides, shock treatment and well-placed trichlor tablets (NOT WITH VINYL POOLS). Broader areas can be treated with a granular trichlor (NOT WITH VINYL POOLS). Calcium is usually associated with scaling or pool water cloudiness. Yellow discoloration is not a characteristic of calcium. The discoloration is probably not related to any defect in the marcite finish. I hope that I have been helpful. At what point is it deemed necessary to remarcite a pool? We are in the process of closing on the sale of our home and the home inspector "recommended" that that pool be remarcited due to a few minor areas in the pool surface. I plan on calling a pool inspector tomorrow to come out and inspect the pool, but I was curious at what stage that remarciting becomes a MUST rather than a nice thing to have done. As far as I know, there are no major problems with the pool. Thanks for any guidance you can provide. Good question! You're right in that everyone wants a perfect pool. Unfortunately, the eyes gravitate to the imperfections . Depending upon the nature of the water source, the presence of trees and how well the water chemistry is maintained, stains are something that may occur from time to time. But, that doesn't mean that you rush out and resurface the pool. Stains can be removed and pools can be acid washed. However, when the plaster finish is worn so thin that the underlying cement is close to being exposed or there are obvious signs of damage, a refinishing is the logical consideration. Some masonry finishes are more chemically resistant, longer lasting and less prone to staining. Plaster is not the only option. How about a hybrid-epoxy pool coating with a 15-year warranty? Ultra Poly One Coat can restore the pool's good looks and it less prone to staining and has less impact on the pool water chemistry. Read the first letter on this page: Pool Coatings and Paints. It is difficult for me to be more specific, without being able to see the pool. Several years ago we bought a house with an in-ground pool which has been resurfaced with a fiberglass liner. It was a resurface over the previous marcite surface, not a drop-in. There was a 25 year warranty on the surface, but the company who did the work is apparently no longer in business. I have received conflicting advice on brushing the walls of the pool, one source indicates that is not a good idea because the surface can be scratched, others say there should be no problem. The surface itself seems very durable. If I do not brush the walls I get a yellowish film on them which turns cloudy when brushed off. Can you tell me what the proper maintenance for this type surface would be? Also I am considering an automated pool cleaner, (the pool has a vacuum return) is one type cleaner better than others for a fiberglass surface? Thank you for your consideration. You don't have a fiberglass pool. You have a gunite pool with a fiberglass finish. The problem sounds like iron or other metals. Have the water and tap water tested for iron and copper. Even if not present, add a double dose of a quality, phosphate-free metal treatment, such as Liquid METALTRAP. If your tap water contains metals, add a maintenance dose monthly and prior to adding new water. You might have to drop the pH below 6.5 to get the yellowish deposits to dissolve. There is a lot of information in the archives, on this topic. You should be able to brush the finish. It all depends upon how thick the gel coat finish was applied. Frequently, 600 grit sandpaper or automotive compound are used on stubborn stains. Just test a spot before doing a wider area. Robotic Pool Cleaners can be used with fiberglass pools, require no installation and provide excellent results. Good luck and I hope that I have been helpful. Hello, can you please tell me the pro's and con's of different types of exposed aggregate products. I am in the process of having a pool resurfaced and have come across two products, but no one can explain the difference. Thanks. Both products are described as exposed aggregate finishes. They could be difficult to tell apart. The more important thing is the experience and quality of the application. If not done properly the pool finish could be streaked, resulting in a problem. Make sure that you see some of the actual pools, in your area, that have been refinished and check on references. Good luck with the project. Thank you for your reply, but you have not answered my question. What is the difference in the products? Thank you in advance. I don't know that there are significant differences. They are both intended for the same purpose and could be utilizing the same colorants. The actual plaster formula probably is different, but I do not have any access to what amounts to a trade secret. Compare the price, look and warranty. Good luck with your choice. Almost two years ago I had my pool replastered. Slowly round nodules began to form on the bottom, let's say about 50-60 to give you an idea. The company said to keep brushing it, which I did. About 6 months later, when the nodules became about nickel sized, I called the company again to come and take a look. Said it was Calcium deposits, sanded them down and reassured me that the problem is gone. Same thing again about 8 months later. Then they were "busy". Now I need to call them out again. The appearance of the plaster has always bothered me. The old one had a uniform look to it, but the new plaster looks more like marble, it has larger-smaller clumps of lighter and darker material. Was the plaster improperly mixed? I keep the chlorine between 1-2, pH between 7.2-7.6. Hardness is under 300, although it was lower when the pool was just filled. Any help you can give me is greatly appreciated! Nodules are related to delaminations, voids or cracks beneath the surface, that are connected to the pool water by pinholes or hairline cracks. The chemistry within this subsurface feature can erupt, causing a surface nodule. Nodules happen most often on refinished pools. The best way to avoid the problem is to properly prepare the old surface, so as to allow for good bonding, use the proper mixture of materials, use proper application techniques and allow for normally hydrating and curing. Nodules may happen one or more times. It is related to the nature of these voids and their contents. While sanding can be used to remove them from the surface, the problem may reappear. Once the calcium mineral content of the voids has been eliminated, the problem should cease. It has not been conclusively demonstrated that actual pool water chemistry alone can cause or eliminate the problem. Sorry that I don't have a quick fix for you. The uneven appearance of the pool could be indicative of a lack of uniformity and could have been contributory to the problem. I hope that this information will prove helpful. Thank you for your quick reply and analysis of my problem. Since these modules have been appearing for two years, is there any hope that the problem will diminish or should I insist that the company replaster? My two year warranty will expire soon. This may put you on the spot, I apologize. Just your opinion please. Thanks again. I am not sure that refinishing will positively solve the problem. The problem could run its course and then a proper refinishing might be in order. Otherwise the underlying problem could erupt through the new surface. I suggest that you ask the contractor to extend the warranty. If the warranty isn't extended, I would opt to have them refinish the pool. That should be enough to convince them to extend the warranty. Good luck. ► Exposed Aggregate Deck Problems? Hi. We would be most appreciative if you can help with this problem. We have exposed aggregate (well aggregate...not sure what the 'exposed' definition means) surrounding our indoor pool. Our pool maintenance people have splashed strong chlorine solutions, or even dropped pucks (not sure) in a few areas on the deck. Further, my son had a plastic basketball hoop on a stand at one end of the pool; it was filled with pool water to maintain balance. However, while it remained there, the water beneath pooled around the bottom & ate away at the surface coat & now the stones underneath are discoloured and whitish. Now, what is interesting & The Big Problem, is that I had someone wash the end where the basketball hoop was & then re-seal the area. Initially, the area with whitish discolouration disappeared & we were all happy. However, within 2 or 3 weeks, the whitish discolouration re-appeared! No one seems to know what to do! I am sure there is a solution as this must happen frequently. Chlorine splashes on aggregate, but I have yet to find anyone who is familiar with this. Can you help? Many thanks in advance. Exposed aggregate consists of a white Portland cement and various colored aggregates. These aggregates can simply be colored pieces of quartz or solid colored particles or ceramics. In your case, it seems to be particles with a surface coloring only. Evidently, the chlorine and corrosion has destroyed the colorant and left the underlying aggregate particles colorless. Not all aggregates are susceptible to this problem. Splashing liquid chlorine on the surface, exposed the aggregates to a chlorine concentration about 10,000 times greater than that in the pool. This high concentration caused the irreversible damage. A similar scenario could have happened with the pucks. I am not sure how popular exposed aggregate decking, made with materials such as were used in your pool, is or if this is a common problem only with certain aggregates. Some products are more chemical resistant than most other types of plaster. I really can't offer a solution to the problem, only a suggestion about avoiding more. Have a salt chlorine generator added and you should not have to add chlorine to the pool again, except under extraordinary circumstances. No chlorine, no handling and no spills! And better water quality with less effort! Sorry that I don't have a solution. I hope that this information will prove helpful. ► Using A Salt Chlorine Generator? I am in the midst of having my pool refinished with exposed aggregate. I am considering having a salt chlorinator installed. ANY SUGGESTIONS? Thanks for your help. After the pool has been refilled, adjust the pH, total alkalinity and calcium hardness level to within the optimum range. In addition, I would add a quart of a quality mineral treatment, such as phosphate-free Liquid METALTRAP, as it help avoid metals stains and help keep the electrode plates, on the salt chlorinator, free of scale. Salt chlorinators require about 20-25 pounds (may vary depending upon the unit and the manufacturer) of salt per 1,000 gallons of water. Before adding the salt, check with the contractor, as to how much time must be allowed for the walls to cure. You don't want to risk the warranty. Good luck with the pool work. ► Stains On A Drained Gunite Pool? Alan, we are clueless! We drained our gunite pool planning to paint the walls due to a staining problem. We were told that we were better off trying to remove the stains, instead of painting. The walls and bottom have a light green tint and there are many dark brown circular spots. We have tried using muriatic acid and also liquid chlorine with a deck brush. Nothing is working! What's is our best course of action now? We've only lived in the house a year and have never had any experience operating a pool. HELP! Thanks for your time. There are lots of painted pools, but I am no expert on this topic. If you used liquid chlorine and the stains did not come off, it is safe to assume that they are not algae stains. If you used full strength muriatic acid and the stains did not come off, it is possible that acid washing the pool will not provide satisfactory results. You might try using some vitamin C tablets, on a small area. If this works, you should be able to remove the stain, by brushing the walls down with a solution of MetalTrap Stain Remover. If it looks acceptable, you might not have to paint. If nothing works, your choices might come down to painting the pool or refinishing the pool. Refinishing/resurfacing choices include: marcite, exposed aggregate, pvc, epoxy, fiberglass and others. 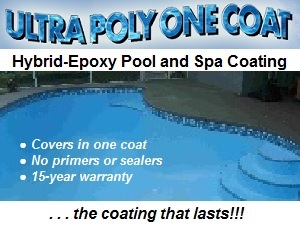 Ultra Poly One Coat is a hybrid-epoxy coating has should provide better stain resistance, than masonry pool finished. Easier chemistry too! Get some professional opinions before deciding. Good luck. I hope that I have been of some assistance. I have a particle aggregate finish that was refinished about 1 year ago in my 12,000 gallon in-ground pool. When it was first refinished, the company said to keep brushing the sides every day and keep the water on the acidic side to remove the "cream" which comes out of the new finish for about a month or two. It's been a year, and the "cream" is still coming off. When I brush the pool, I see a white cloud that disappears into the water. My calcium is 500, which the pool store said is high, and may be the cause of the white cloud, so they suggested removing 1/3 of my water and replacing it with my water-softener water from the house. I don't know if the white stuff is due to the high calcium, or a botched refinishing job. I also don't know if it is better to use water-softened water or non-soft to refill my pool. I also wanted to know if there is an easier way to reduce the calcium other than removing water and refilling it. Thank you. Unless you have been using calcium hypochlorite, the high calcium hardness level is probably due to the maintaining of the aci dic conditions for an extended period of time. A level of 500 PPM can lead to sale formation and cloudy water, especially if the TA and/or the pH are too high. It is not possible for me to say that calcium is the cause with certainty, as the possibility of dead algae still exists. You can lower the calcium level by replacing about 1/3 of the water with soft water or you could opt to add some calcium sequestering chemicals to the pool. The latter should work, so long as you keep the pH under 7.6 and the TA under 80-120 PPM. You should have been long past this type of problem. This does not mean the plaster job was defective, although I can't rule it out. I would attempt to create optimum pool chemistry and, if the problem persists, your complaints will have more validity. Having the right pool water tester can be a big help. Check out the all-digital ColorQ Water Analyzers. Good luck. ► Preferences With Salt Chlorinator? We are in escrow and will be taking care of our first pool. The pool needs a new finish. What is a fair price on a gunite finish? And what finish, if there is one, goes best with salt water sanitizer. Thanks, I'm glad I found this site. Gunite is actually the concrete material that underlies the plaster finish. The popular masonry finishes include marcite or exposed aggregate. The exposed aggregate finishes are longer-lasting, more chemically resistant and, probably, slightly more expensive. Cost varies with the geography and the pool size. I am not up-to-date on pricing, so a real estimate is not something that I can offer. However, you should expect to spend a few thousand dollars, depending, of course, on the pool size and other specifics. Salt chlorinating systems can be used with either type of finish. I would check with the pool resurfacing company, as to how the pool walls should be allowed to cure, before adding water or chemicals. I hope that the information proves help and good luck with the house and the pool. ► Check Cracks In A Gunite Pool? Can the absence of chemicals in a gunite pool cause check cracks? Can a chemical imbalance cause check cracks? Chemical imbalances can lead to surface etching or scale deposits, but not necessarily check cracking. Absence of adequate calcium hardness can lead to the dissolving of some of the calcium-containing minerals present at the surface. Draining of the water can lead to a drying out of the surface and possible problems, if allow to remain in that state over prolonged period. Inasmuch, as I'm not an expert on this subject, you might seek a more definitive opinion. Good luck. Alan, my dog got into my grey bottom pool before I filled it with water. He left paw prints all over the bottom of the pool. The pool has been filled for a couple of days and I have tried scrubbing it with no success. Any suggestions on this? Thank you for your time. This is definitely a new one on me! You haven't given me much in the way of details. I suggest that you contact the contractor that built the pool and run this by him. There is one possibility that comes to mind. You could siphon an acid solution ( 50% muriatic acid and 50% water - add the acid to the water and water rubber gloves and eye protection) using a stain removal accessory (many pool stores carry such a gadget). This will etch the area around the paw prints and, perhaps, soften the look. BEFORE DOING THIS CHECK WITH THE CONTRACTOR! DON'T DO ANYTHING THAT WILL JEOPARDIZE THE WARRANTY! I hope that this will work for you. Good luck.